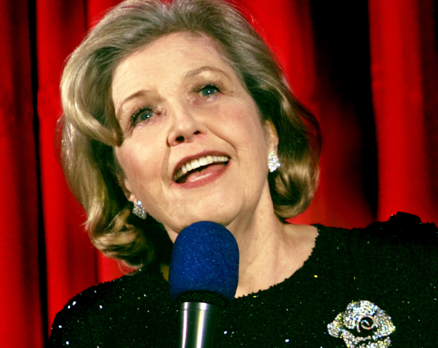 This is the first show from Anne Reid that I have seen since seeing one of her very early attempts at cabaret about 2 years ago. Since that time Reid has been having the time of the life, apparently, appearing Desert Island Discs, Who Do You Think You Are, receiving a MBE, and being bestowed the grand accolade of Pin-Up of the Year for The Oldie magazine. And, she has done a lot more cabaret. The difference is very noticeable. Her ability to hold an audience shone from the start (see my review), but now there is a calm assuredness and relaxed demeanour that is a delight to see. Tonight’s programme features an eclectic mix of songs, often surprising with no discernible theme, except perhaps many of them are songs she has loved for a long time and wanted to sing. This new project provides the first opportunity for her to work with celebrated Musical Director and accompanist Jason Carr, who furnished her appropriately with a clever arrangement of Wanna Sing a Show Tune (Michael Feinstein), provided additional vocals and performed with her one of the standout items of the evening How Could You Believe Me When I Said I Loved You, an amusing comment on the dynamics of the often delicate relationship between Musical Director and singer. As well as a lovely rendition of one of Reid’s signature songs Errol Flynn (Amanda McBroom), there were comic numbers such as What Do We Do? We Fly!, about the difficulties of air transport, a medley of Rogers and Hart songs and some more wistful numbers looking back on her life, such as the spoken-sung Memories. Reid’s singing, whilst not performed with a particularly strong voice or vocal technique, is clear with excellent diction enabling the story –line to flow, but the real strength of this show is the well-constructed, witty and intriguing links between the singing. Her fascinating stories, such as being ferried about the world by young pilots when she was a young girl of 12, working with actor Daniel Craig, being bombed out of her home in the war and the capers of her fearless mother are both self-deprecating and funny and lead effortlessly into the songs, such as Once Upon A Time. The show concluded with the charming title song I Love To Sing, and all in all, this is a nostalgic look at her life and career with highly engaging anecdotes and warm audience rapport. This entry was posted in Cabaret Reviews and tagged Anne Reid, cabaret reviews London, Jason Carr, The Crazy coqs. Bookmark the permalink.